If the town square is the stage, then there’s no bigger ‘ongoing public performance’ than in Europe’s largest market square, the Rynek Glowny (‘Grand Square’) in Krakow, Poland. There’s enough to see and do in and around the square for a week straight, and enough for residents to make it a large-scale third place. It’s a good lesson in what a destination public square can be. Cloth Hall, a 16th-century, Renaissance-style building, a primary attraction, houses a gallery of 19th-century art on the top floor and a market hall for local artisans on the ground floor featuring traditional Polish crafts from wood carving to amber working to felt dragon stuffing. For modern creatives, the square is surrounded by contemporary cafes, delis, art galleries, as well as jazz clubs and museums, and is itself animated by outdoor diners, street musicians, artists, birds and wandering spectators taking it all in. With a nod to history and thus a bit of culture, each hour a bugler plays the tune (from the tower this picture is taken) that 13th century guards used to sound the alarm when invaders approached. Once during an invasion, an arrow pierced the bugler’s throat mid-tune. To this day the buglers end the song abruptly at the same place in the song each time. Image source: View from the Town Hall Tower by karlakp. What a beautiful part of the world! Cars are conspicuously absent here. Is traffic limited in this space? I spent the week there in the fall of 2004 and spent almost all my time in and around the Rynek Glowny. If I remember correctly, car traffic is outside of the square maybe with a 2 block buffer around the square. The underground bars near the square, the revitalized old Jewish district, and the delicious Kebabs are fond memories and worth experiencing if you are ever there. And, as a backpacker the hostels and hotels where all in walking distance to the square. 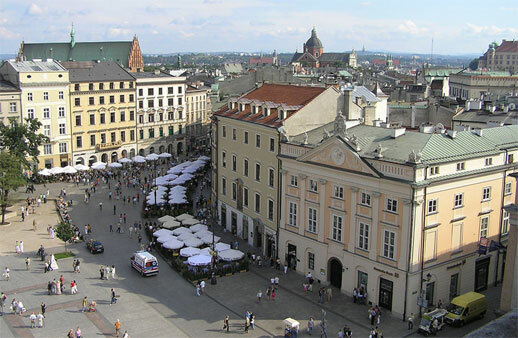 The Rynek Glowny is a great example of a third place. Ahhh, those where good times.